Toxins in #Rhododendron nectar have lethal effects on native Irish honeybees, but native bumblebees are able to make use of this food source without suffering. Botanists from Trinity College Dublinhave discovered that the nectar from a common, non-native plant, is toxic to some bees. These effects vary based on the species of #bee consuming the nectar, but they are lethal to some. Common rhododendron is one of the most invasive plants in the United Kingdom and is also notorious in Ireland for threatening native forest habitats. In the study just published in Functional Ecology, research led by the Trinity botanists with UK collaborators at Royal Botanic Gardens, Kew, University of Greenwich, Royal Holloway University of London andNewcastle University, shows that its nectar is extremely toxic to nativehoneybees. 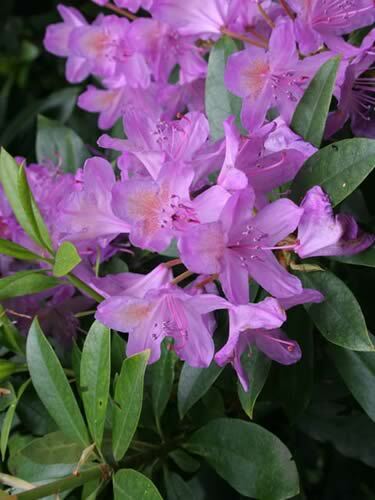 The nectar contains grayanotoxins (natural plant produced chemicals), which occur in leaves and help rhododendrons avoid being eaten by insects and mammals. The study, funded by Science Foundation Ireland and the Irish Research Council, was led by Research Fellow, Dr Erin Jo Tiedeken, and Professor in Botany, Jane Stout, of the School of Natural Sciences in Trinity, with the collaborators from the UK. The team fed artificial nectar containing realistic concentrations of grayanotoxins, isolated from the Rhododendron flowers by scientists at Kew, to three economically and ecologically important pollinating bee species to investigate how these nectar toxins impacted native #bees. However, the reactions of the honey and solitary bees to nectar grayanotoxins were very much in contrast to the response of a native Irish bumblebee species. Native buff-tailed bumblebees were able to consume the nectar with no negative health impacts. Furthermore, even when the bumblebees were weakened by lack of food or parasite infection, eating Rhododendron nectar exerted no negative effects. As a result, invasive Rhododendron could provide an important, abundant nectar resource for this bumblebee species, especially in the early spring when bumblebee queens are establishing their colonies.